Farmers can patch up a tractor's flat tire in the field and hope for the best when it comes to the weather, but it's the problems they didn't create and can't fix that leave them most frustrated. As President Trump came stumping in Luzerne County on Thursday night, Pennsylvania and New Jersey soybean farmers find themselves in the middle of a trade war they didn't start, and while the president has asked the nation's farmers to "be a little patient" and offered $12 billion in emergency relief, they are repeating a familiar mantra: They want free trade, not aid. "I hope he knows what he's doing," said Bill Bibus, a third-generation soybean farmer from Chesterfield, Burlington County. "The aid will help us out, OK, but in the long term it could hurt us because these buyers could just look for other markets." In March, Trump placed tariffs on imported steel and aluminum, and China's retaliatory tariffs on imported soybeans have caused the price to fall by $2 a bushel. Soybean farmers said the price often fluctuates — 10 cents here, 50 cents there — but as the harvest approaches and Chinese buyers remain hesitant, they have to worry about stockpiling soybeans in silos and hoping for a better future. "I am a big Trump supporter and I believe in his whole philosophy, but it's costing us big bucks and I'd rather not get into a welfare state with handouts," said Daryl Alger, who operates one of Pennsylvania's largest soybean farms at 6,000 acres in Lebanon County. "For me and my potential crop, it could amount to a $600,000 to $700,000 loss." 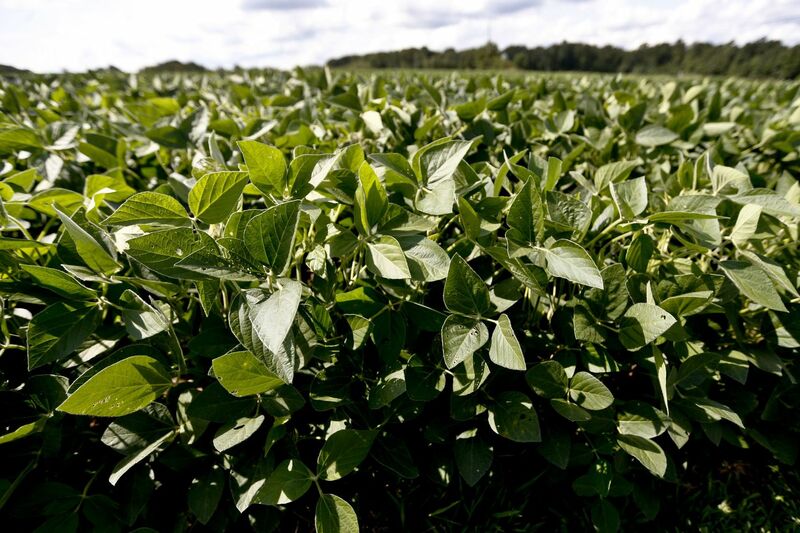 The production value of the U.S soybean crop last year, according to the USDA, was $41 billion. Pennsylvania's crop accounted for $259 million of it. New Jersey harvested $41.8 million worth of soybeans. Illinois and Iowa, the nation's largest producers, accounted for $5.8 and $5.1 billion respectively. A timeline of soybean prices over the last four decades resembles an ominous mountain range with lows of $2.50 per bushel in the early 1970s, highs of $16 per bushel in 2012, and just over $9 as of Tuesday. In March, the price was $10.70. "Agriculture was doing just fine with its export markets," said Pete Furey, executive director of the New Jersey Farm Bureau. "Given a choice, we'd prefer no tariff war and their impacts over this aid package." John Kiefner, 54, checks soybean plants on his farm in Will County, Ill. He expects farmers will try to cut back on expenses with soybean prices down. He projects making a profit only from production of straw and hay this year due to the trade war with China. Mark O'Neill, of the Pennsylvania Farm Bureau, said net farm income in the United States is down 50 percent from four years ago. The livelihood has always been difficult and always will be, he said, even with the implementation of new technologies, but adding tariffs into the mix just makes it all that much harder. "If you ask us what we should do, it would be to rescind these tariffs and negotiate," O'Neill said. "It's not supposed to be a winner and loser in trade, it's a win win. " How or when the $12 billion in aid will be distributed is unclear, he added. "This isn't what we want," he said. "If they're going to send a farmer a check because of issues [the government] created, the farmers will take it, but it doesn't solve the problem." Trump, who spoke in Wilkes-Barre on Thursday night in support of GOP Senate candidate Lou Barletta, addressed the American Farm Bureau's annual convention in January, commending himself for helping their cause. He hinted at reviewing trade agreements to make sure they were "reciprocal." "We're fighting for our farmers and we're fighting for our country, and for our great American flag," he said. Luzerne County, according to the USDA's latest census of agriculture, lost 54 farms between 2007 and 2012. The state lost 3,854 over the same period. New Jersey lost 1,256 during that period. "It's getting harder and harder to find anything easy in farming," Bibus said. "I average 90 hours a week." William Beam, a soybean farmer from Elverson, Chester County, said he supports Trump's efforts to "align our trade deficit." "I think it's twofold. Tariffs are getting blamed on it, but we're also growing the biggest crop ever in the United States," Beam, 58, said. "Has the price dropped? Yes. Is it a dire situation? No. I've sold soybeans for less than $5 a bushel and that had nothing to do with any tariff or trade war. Trade disagreements are just part of the deal." But Bibus recalled government interventions from the past that still affect every soybean farmer in the country. In 1973, President Richard Nixon enacted an export embargo on soybeans because of shortages, and President Jimmy Carter imposed a partial ban on grain exports to Russia in 1980 in response to the invasion of Afghanistan. Both actions helped Brazil step in and rapidly expand its soybean production. China has become a major market for Brazil's soybeans, which is expected to only get bigger because of Beijing's trade war with the U.S.
"Today, they are our biggest competitor," Bibus said of Brazil. "This is all political stuff, not farming, and I sure hope Donald has something up his sleeve." John Kiefner, 54, checks soybean plants for pests, such as the Japanese beetle, on his farm in Illinois.